iOS 5 will include a proprietary chat client dubbed iMessage for iOS-to-iOS chat and sharing of media, a system not unlike Research in Motion's BlackBerry Messenger. The new iMessage application is based on the same push technology developed in-house by Apple and previously used for application notifications, as well as push e-mail and contacts. It, along with Apple's FaceTime video chat standard, internally uses an IM-like system to deliver messages and notifications. iMessage replaces the existing native Messages application on the iPhone, allowing for both Apple's proprietary iMessages as well as traditional text messages to be sent and received. It also marks the debut of a native messaging client for the iPad and iPod touch. 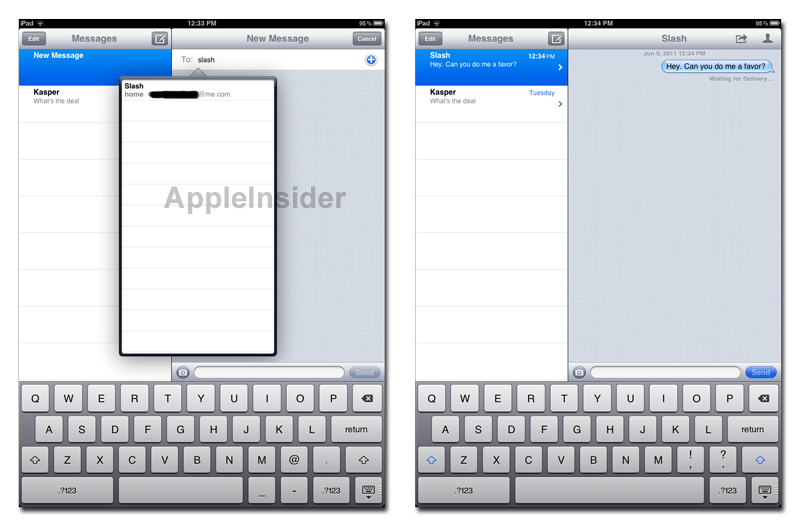 With iMessage, users of all iOS 5 devices will be able to chat with one another. Because no phone number is associated with devices like the iPad and iPod touch, the iMessage client will work much like FaceTime currently does on those devices, and will be linked to an e-mail address. In addition, without access to a phone number, an iPad or iPod touch will not be able to send traditional text messages; that capability remains an iPhone-only feature. Wireless carriers were said to have been caught off guard by Apple's announcement of iMessage this week. Fees associated with text messaging and MMS sending of pictures and videos are a very profitable component of the wireless business for carriers. 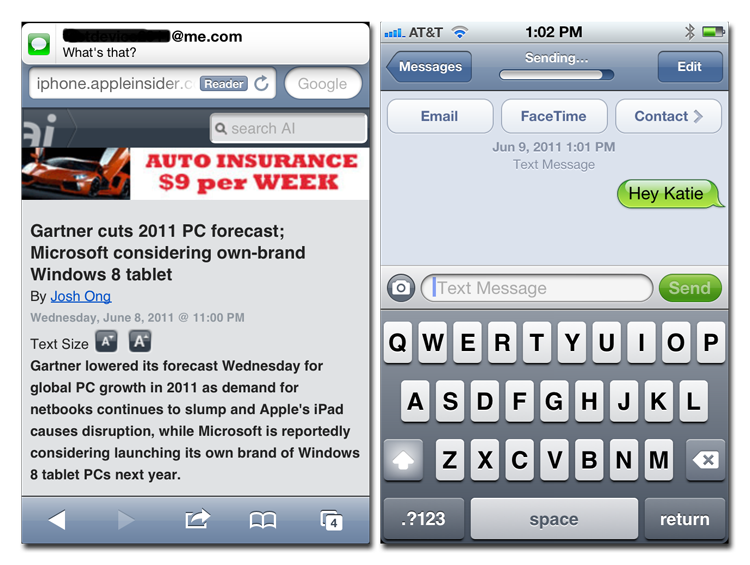 Of course iMessage is not limited solely to text, as users can also share video and pictures with other iMessage users. Traditional MMS functionality was a feature that iPhone users originally waited more than two years to gain access to in the U.S., as AT&T didn't enable the feature until September of 2009. With Apple's new iMessage, when something is sent to another iMessage user, the status of the message is made available with confirmation of sending, receiving and reading. In addition to knowing when the person on the other end has viewed the message, users can also see when the person they're talking to is typing, much like with desktop-style instant messaging clients like iChat and AIM. 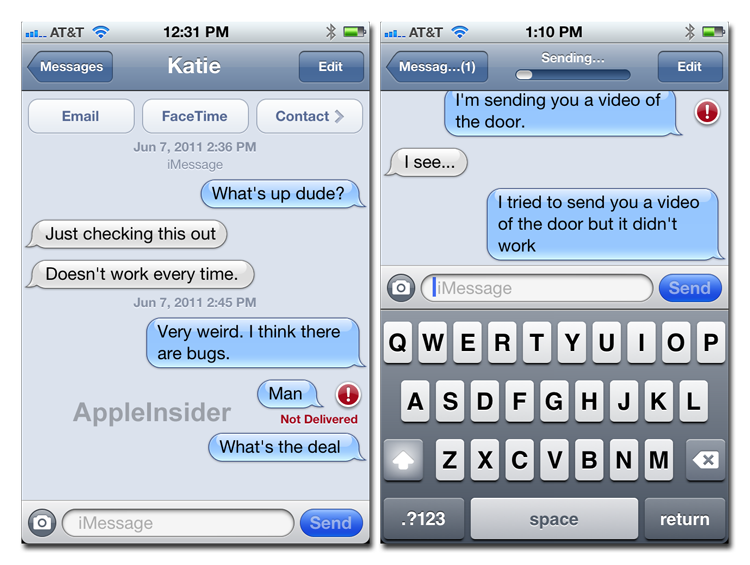 Video walkthrough of iMessage on iOS 5 courtesy of AppleInsider reader Nick Wellings. The native application also differentiates between iMessages and traditional text messages with a grayed out indicator in the entry box. Before a user begins to type, the system informs them whether the message they are sending is a "Text Message" or "iMessage." Traditional text messages and iMessages can also be quickly differentiated based on a color scheme adopted by Apple. When a text message is sent, it is displayed in a green bubble, as usual. 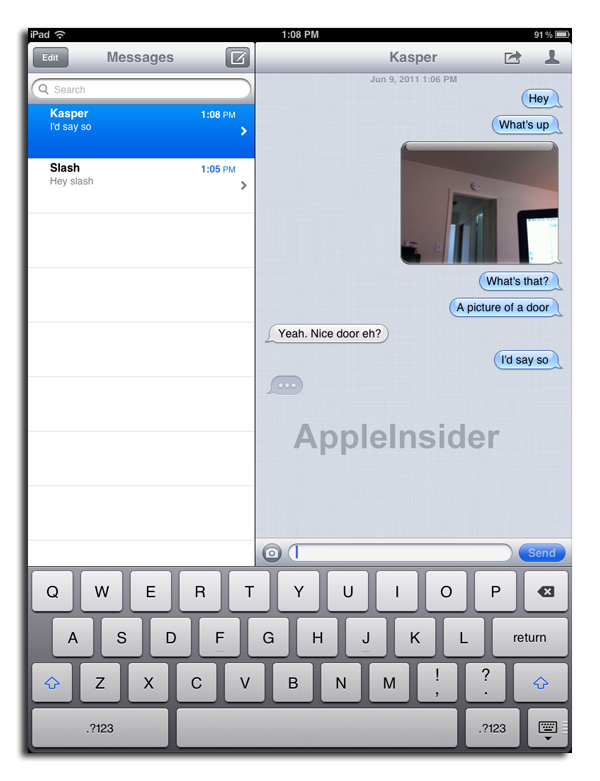 But iMessages are seen in a light blue bubble. Received iMessages and text messages are always displayed in gray. For now, in the first beta issued to developers this week, iMessage has some issues, as messages are often not sent or received. But Apple has plenty of time to work out the kinks, as iOS 5 is not set to become available to end users until this fall.